Even food and beverage processes utilize sensors, and not just in controlling the movement of machine components in relation to product position or location. Sensors are employed in product quality grading and container fill capacity as well. Sensors mimic the human senses of sight, hearing, and touch, processing information more rapidly and accurately than their human counterparts. With the myriad uses of process sensors, there are challenges in sensor design as well. They're always there (no vacations or sick days). They can be placed in limited or confining spaces where humans can't reach. Sensor arrays can communicate to completely control a process through an interface. Sensor can handle environment that are unsafe, unhealthy, and potentially dangerous or life-threatening to humans. The last one — handling rough or dangerous environments — still presents some challenges to process control sensors. When used in industrial manufacturing, for example, they're subject to the Big Three: shock, vibration, and chemicals. Used for industrial machine control, vibration can damage the sensor housing over time. This can be overcome — or at least slowed down — by using single-piece metal housings to contain the "guts" of the sensor. Metal-housed sensors also combat the ravages of chemical exposure, and to a major extent, shock or limited contact with moving parts. For inductive sensors, this provides a form of body armor. Using stainless steel also inhibits corrosion and deterioration from chemical exposure. Another challenge for sensors is the medium or object sensed. In the past, the human eye was the sensor of choice for transparent objects such as glass, transparent film, and many liquids. However, newer UV technology permits photoelectric sensors to overcome this challenge. 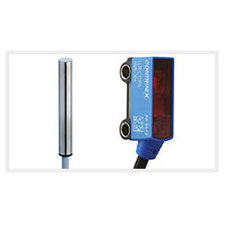 Other types of sensors can also determine the depth of liquids when installed over the container. Of course, for a sensor to be useful it must "talk" to some form of controller. In most cases, they are connected by some type of cable. It could be fiber optics, or copper as used in coax or bundled wiring. However, many newer sensors connect wirelessly. And as the IoT or internet of things progresses, sensors are used to transmit signals and information, not just across the factory floor, but worldwide as well. The challenges of sensors today are being overcome to bring on the greatest process control opportunities for tomorrow.